This is the city. Los Angeles, California. Some odd million people, some of whom buy into detectives having psychic powers. I don't. If you want someone found, or someone's criminal scheme totally ruined, you should call a non-psychic like me. I carry a badge. Duhhhnnnn, da dum dum. Originally, this article was going to be what has become my standard fare: a tale of some sort of paranormal skullduggery, followed by picking it apart and demonstrating it to be hogwash. But all of that has changed. It changed because of a man named Jucelino Nobrega Da Luz. He changed this into a blueprint for making money. Let me back up. Da Luz is either a very mad madman or a very cunning con man from Brazil. He’s stepped forward to claim the $25 million reward offered for capturing Saddam Hussein, despite the fact that he’s not once set foot in Iraq. He claims to be a Psychic Detective, and that he was able to determine the location of the fugitive ex-president through use of his supernatural mental powers. After using a technique called “remote viewing,” in which one can supposedly picture distant locations with only the power of their mind, Da Luz sent letters to “the American government” detailing the exact location of Hussein’s spider hole on a farm in Tikrit. And for that, he says, he deserves adequate compensation. Since Da Luz first made his claims public, the Brazilian justice system has heard his case a number of times, finally deciding that he should take the matter up with the American courts. You heard that right: busy judges, lawyers, and clerks had to take time from their busy days and burn through tax money that could have gone to some nobler purpose just to hear this guy out. That’s simultaneously the best and worst part of Democracy: our legal system has to pretend to be as dumb as our dumbest citizens at least long enough to try and see their side of things. Sadly, Da Luz is not alone. There’s a whole buffet of people that want the world to believe that they have advanced mental powers that help them solve crimes, and that they should be made rich because of it. 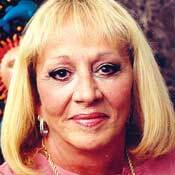 Sylvia Browne. Ugh. If you look directly at this picture, induce vomiting. She claims simply that she doesn’t want or need a million dollars. That’s certainly true. A 30-minute telephone audience with Sylvia costs $750, and she’ll tell you what’s wrong with your life. I tell you what, readers, for the price of a hamburger and a few beers, I’ll meet you at the pub, tell you exactly what’s wrong with you, and how to fix the giant mess you call a life. Seriously. After the second pint, I gain both what could be considered psychic powers and an unshakable opinion on every possible subject. While on the show, she also told Randi there was something wrong with his heart; a few weeks later a cardiologist disagreed. Randi was healthy. This was hardly a life-threatening incident, but imagine what would happen if she said that to one of the gullible folks that shells out nearly a grand to talk to her. I digress. I know that she has claimed to have solved at least 35 criminal cases, because that’s the number that she’s talked about on Montell Williams. These cases were investigated in something called Brill’s Content, where a conclusion was reached that, if you are the most easily surprised person on earth, will surprise you: in 21 cases, her input was too vague to be of any use, and in the remaining14, families and law enforcement personnel said she was either wrong or of no use. FIRST– Watch a few episodes of CSI. If you’re going to be a psychic detective, the word of the day is to always play the odds. If someone is missing, there’s about a 50% chance that they are alive. If not, they’ve been buried somewhere remote (of course; criminals usually want their corpse disposals to go without notice) and probably in a sloppy manner (also of course; criminals are in a hurry to get away from the scene of the crime.) Custom tailor your predictions: if someone goes missing in New Jersey, telling the police to look for cacti or penguins is probably one for the ‘miss’ column. On CSI (or Dragnet for the old fashioned) there comes a point in every episode where one of the detectives says something along the lines of "well, criminals almost always...". Memorize and regurgitate as appopriate. THEN– Shotgun. Shotgunning is probably the oldest technique that psychics use; it relies on the human tendency to forget misses and remember only hits. If you give the police a hundred clues and one of them turns out to be correct, chances are they’ll be lauding your psychic abilities. ALSO BE SURE TO – Reinvent History. If you go out on a case and you keep getting misses (you predict a death and the person turns out to be alive, so on and so forth) wait about a year and then start claiming that you were right. Chances are no one will really remember the details of the case, and you should definitely be eloquent enough to convince people who were not involved originally that the end of the case came about specifically due to your help. DON'T FORGET TO... – ...make some stuff up after the fact. A few months after the September 11th attacks, Sylvia Browne claimed that she had correctly predicted them before hand. And, for some insane reason, people believed her. As far as I know, no one has asked her “if you knew about them before hand, why didn’t you tell anyone so as to prevent them?” Even more sadly, no one has charged her with complicity in a terrorist plot and sent her to prison. FINALLY – Be vague. The more specific you get, the more unlikely it is that you’re right. Take this example, which borders on nauseating: the family of one victim considered a psychic detective’s drawing of a circle to be a vital clue in their case, because the culprit was eventually caught driving a cement truck. The point is, that if you’ve got some basic people skills, if you’ve read up on the technique of cold reading, and if you lack what most people would refer to a conscience, then you’re ready to start earning fame and fortune as a psychic detective. If it occurs to you at some point during this lucrative career that your involvement is diverting manpower from a real investigation, don’t worry about that. If you don’t do it, someone else will. You may consider it a hurdle to your scheme that the FBI and the National Center for Missing and Exploited Children adamantly maintain that no psychic detective has ever been of the slightest use to them. But don’t worry, the sort of people that turn to psychic detectives will completely disregard that sort of evidence against paranormal superpowers. You should be more worried that the FBI refuses to even talk with psychic detectives, and that in some states to do so is actually a felony.